This Thursday we continue on with Jean La Forêt's diary. Since only a small portion of the next page was needed to finish the last entry translated, I'm counting this week's first page (above) as a complete one. Remember, as of last week's episode, Jean is no longer in the U.S. Army but has joined the Marines. Changeons de quartier – Caserne nouvelle bâtie trés confortablement. A Mare Island Avril 20 – 97 – 3h. 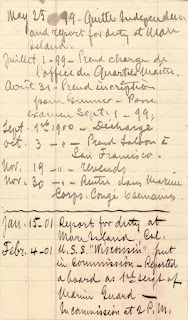 P. M.
May 25 – 99 – Quitte Independence and report for duty at Mare Island. Juillet 1 – 99 – Prend charge de l'office de Quartier Maître. Oct. 3 – " – Prend saloon à San Francisco. 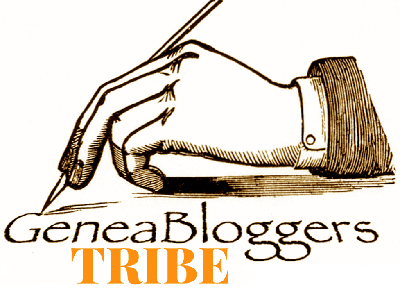 Nov. 30 – " – Rentre dans Marine Corps. Congé 6 semains. 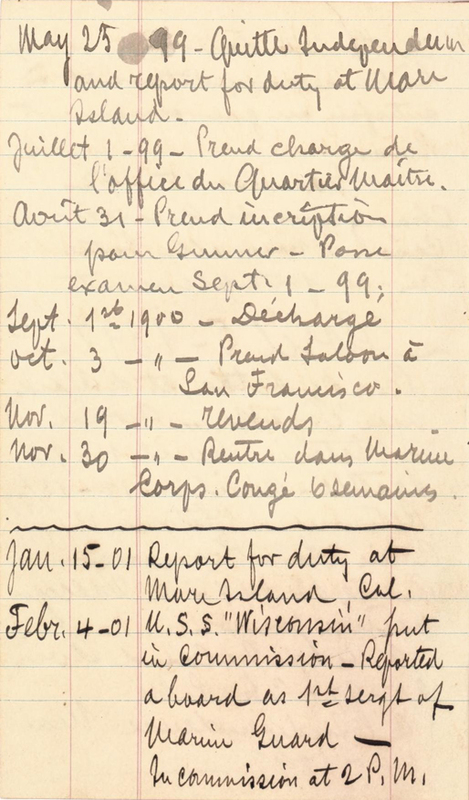 Jan. 15 – 01 Report for duty at Mare Island, Cal. Febr. 4 – 01 U.S.S. "Wisconsin" put in commission – Reported aboard as 1st sergt of Marine Guard — In commission at 2 P.M.
March 28 – 01 Arrival of "Mohican"
April 15 – 01 Arrived in San Francisco Bay 1 P.M.
May 28 – 01 Left San Francisco Bay for Puget Sound, Wash.
June 1 – 01 – Bremerton at 5 AM. June 12 – 1901 – San Francisco. June 29 – Port Angeles, Wash.
Nov. 1 – 01 – Passe l'équateur. We change quarters – new barracks built very comfortably. 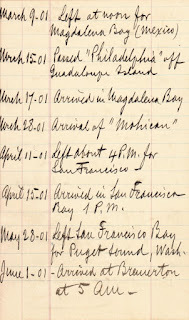 In Mare Island April 20, 1897 3:00 p.m.
May 25, 1899 – Leave the Independence and report for duty at Mare Island. July 1, 1899 – Take charge of the Quartermaster's office. October 3 " – Buy a saloon in San Francisco. November 30 " – Return to the Marine Corp. Six weeks leave. January 15, 1901 Report for duty at Mare Island. 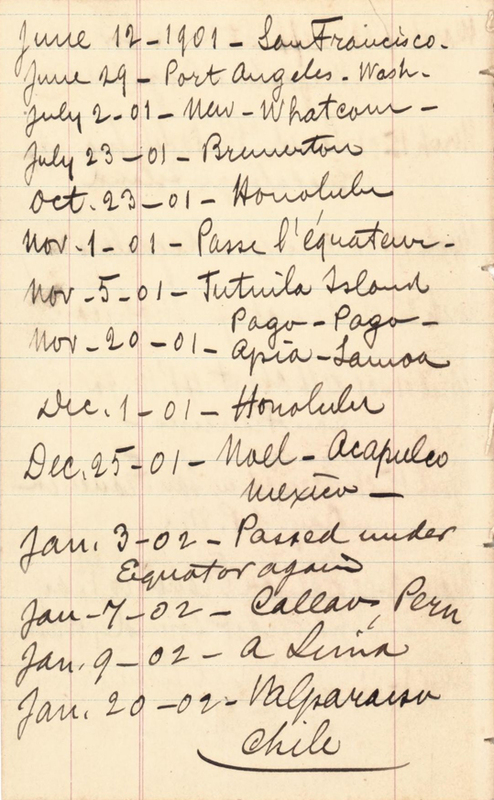 February 4, 1901 U.S.S. Wisconsin put in commission – Reported aboard as 1st Sergeant of Marine Guard – in commission at 2:00 p.m.
April 15, 1901 Arrived in San Francisco Bay 1:00 p.m.
June 1, 1901 – Bremerton at 5:00 a.m.
June 12, 1901 – San Francisco. 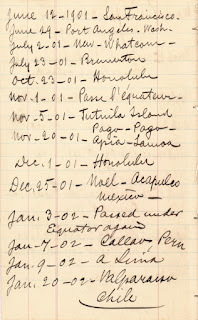 November 1, 1901 – Pass the Equator. This man surprised me again. He enlisted in the Marines on August 26, 1890. He was discharged on September 1, 1900, one year after he passed the Gunnery Sergeant exam and with a little more than ten years service. He didn't stay out even three months before he re-upped (but at least he had six weeks leave before reporting again). I'm sorry, but I just don't understand. He had the saloon in San Francisco for only a month and a half before selling it. Maybe he just had a love-hate relationship with the military and couldn't stay out. He seemed to be pretty successful in the Marines. He was in charge of the Quartermaster's office; he passed the Gunnery Sergeant exam. Jean apparently became more comfortable with English during this period, because about half the entries are in that language. He still goes back and forth, though. He definitely saw a lot of the world while he was in the Marines. Up and down the Pacific coast, around the Pacific Ocean — that's a nice travelogue. I was very disappointed to see the gaps in dates in these pages. 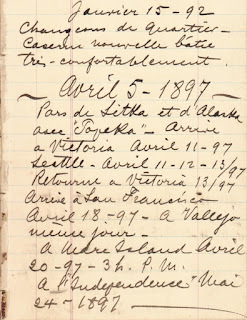 Whatever the reason, Jean did not write between November 1890 (from last week's installment) and January 1892, January 1892 and April 1897, and May 1897 and May 1899. That's eight years we don't know what he was doing, the bulk of this tour in the Marines. Who knows where else he went during that time? Maybe he was on classified missions and couldn't write. I hope those periods are documented in his service file. 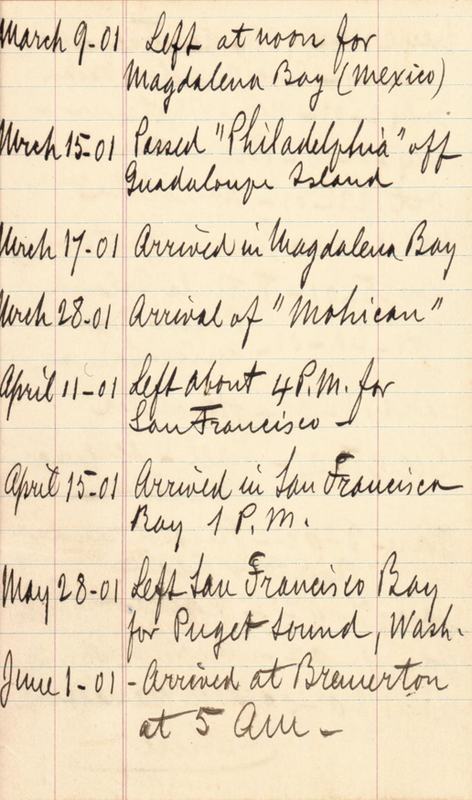 Thinking again about Emma La Forêt's 1917 emergency passport application, where she said that Jean had lived uninterruptedly in San Francisco from 1884 to 1909, we now have more data. 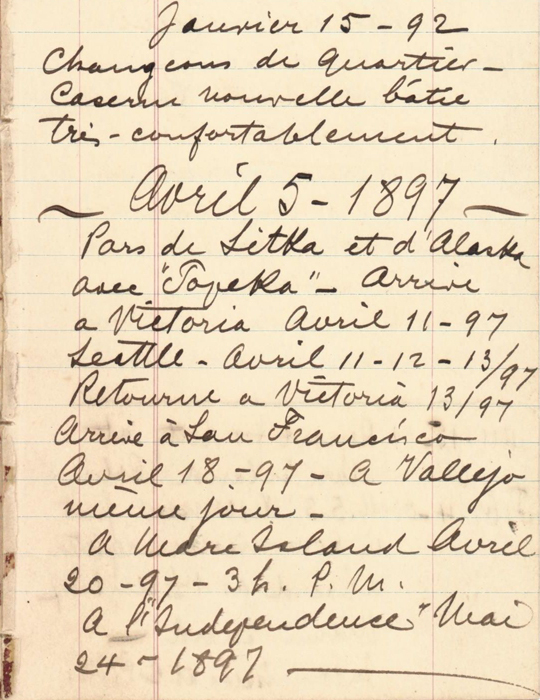 Based on these diary entries, Jean appears to have been in Sitka from 1890–1897. He wasn't in San Francisco an entire day before he went to Vallejo. The longest he might have been in San Francisco was while he owned the saloon, not even a month and a half. Emma was certainly stretching things when she filled out that application. Or maybe she really meant "the San Francisco Bay area."